Progress and potential scaling-up of Colombia’s climate-smart villages presented as contributing to Colombian rural development and peacebuilding. The community hall of Los Cerrillos was bursting at the seams. Many farmers attended the call to greet the special visitors, headed by Claudia Navas, Advisor to the High Council for Post-Conflict, Human Rights and Security of Colombia, an entity created to holistically manage the process that will begin in the country once the peace agreement is ratified. People from the CSV Los Cerrillos-Cauca have gone through a process of empowerment and self-management by the Association of Community Action Boards (JAC in Spanish) to seek for arrangements that generate sustainability and improve their livelihoods, facing challenges such as the impact of climate change and variability, that impacts crop yields, problems with access to water resources, soil degradation, among others. The High Council’s goal was to learn more about the experience of the climate-smart village (CSV) of Los Cerrillos-Cauca, located in rural area northwest of the city of Popayan, to "identify effective interventions of territorial development that could take place during the first 18 months after the endorsement of the Peace Agreement," according to Claudia. #DidYouKnow: Climate-smart villages is translated as ‘Territorios Sostenibles Adaptados al Clima (TeSAC)’ in Spanish? The link between rural development and peace is not an accident, because for more than 50 years, the conflict often took advantage of poor rural people who were looking for opportunities; either planting illegal crops or joining the guerrilla. In fact, the first point of the Peace Agreement that was just signed in Havana, Cuba, involves a comprehensive agricultural development policy. This policy seeks to "lay the foundation for the transformation of the rural sector and foster the conditions for welfare and good living for rural people, the eradication of extreme rural poverty (...), promotion of equity, closing the gap between country and city, the reactivation of the countryside and, in particular, the development of an agriculture based in smallholder farmers, their family and community." Climate-smart villages (CSVs) will do much to contribute to this kind of transformation, according to Ana Maria Loboguerrero, Regional Program Leader of the CGIAR Research Program on Climate Change, Agriculture and Food Security (CCAFS) for Latin America and Liliana Paz, director of the Ecohabitats Foundation. The captivated audience gathered in the community hall of Los Cerrillos, heard about the CSV approach and progress to date in terms of planning for adaptation to climate change and variability with a gender approach, the implementation of a network of community weather stations, actions in food safety and climate-smart practices, and the linkages between environmental education and climate change; they also showed the partners and stakeholders engaged at different scales. The presentation highlighted important contribution of CSVs to the objectives of the comprehensive rural development policy, such as the closure of the agricultural frontier, land use planning, the promotion of sustainable agricultural projects and rural development with a territorial approach. "We are in times of building peace," said Claudia during her visit to the CSV. The range of experiences of applied research by organizations like CCAFS and the International Center for Tropical Agriculture (CIAT), has demonstrated a conviction to help the country focus its energies and resources on building a stronger rural society that can produce a fairer and stronger national economy. The visit of the Advisor began a day earlier at CIAT headquarters, where she spoke with researchers, and heard about their experiences aimed towards strengthening the capacity of smallholder farmers to adapt to climate change and variability. Researchers underlined the importance of engaging with partners to foster sustainable production chains based on inclusive business models; share examples of setting of more sustainable production systems from environmental, social and economical perspectives; and highlighted the use of Big Data as an innovative tool to close gaps in production, and to modernize the national system of technical assistance. "Our experience and neutrality as a research center, allowed us to work closely with partners and stakeholders, acting as a facilitator of the process for different purposes, but always from a participatory and sustainable development approach", said Carolina Navarrete, Coordinator of CIAT for Latin America and the Caribbean. After the meetings on CIAT campus, the Commission moved to the department of Cauca to visit the climate-smart village promoted by CCAFS and other projects that CIAT develops in Cauca. The Ecohabitats Foundation leads implementation of the CSV of Los Cerrillos-Cauca. In collaboration with farmers they test and assess climate-smart agricultural practices, based in the local adaptation plans that they previously made and thus achieve food security and contribute to increased productivity and incomes of the community. “These experiences are a clear example of how research creates a practical effect on the real lives of people and how it can generate changes in production efficiency” said Claudia Navas, the representative of the National Government, at the end of her visit. “We are identifying bottlenecks in policy, logistical and infrastructure issues that prevent farmers to develop their projects and therefore have a better quality of life," she explained. 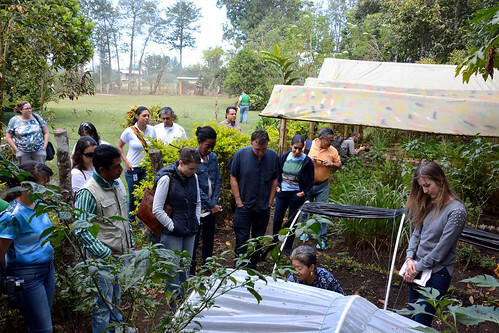 The visit of the Advisor was accompanied by Yesid Gonzalez, director of the Environmental Authority of Cauca (CRC in Spanish), Jimena Velasco Chaves, from the Secretaria de Planeación Departamental, and representatives of institutions of municipal and departmental order, as Procasur, the University Corporation Comfacauca, the Municipal Agricultural Technical Assistance Unit (UMATA) Popayan, and the City Council of Popayan, with whom will be defined strategic alliances to consolidate these processes. In addition, the day was accompanied by a commission of farmers from the CSV of Mahates (Bolivar) under the guidance of Maria Eugenia Rolón, Director of the Canal del Dique Promoter Foundation, which gave some insight into the importance of the farmer to farmer learning with representatives of territories that have suffered the effects of armed conflict on the Caribbean coast, and extending the CSV approach in other regions of Colombia. Written by José Luis Urrea, communications officer for CCAFS Latin America, with inputs from Andrea Carvajal and Adriana Varón, CIAT Communications. Read the related CIAT blog: Agricultural research, an ally for Colombia at peace.